You'll be £29.95 closer to your next £10.00 credit when you purchase Journal of the American Revolution. What's this? Order within the next 4 hours, 41 minutes to get your order processed the next working day! The Journal of the American Revolution, Annual Volume 2016, presents the journal’s best historical research and writing over the past calendar year. The volume is designed for institutions, scholars, and enthusiasts to provide a convenient overview of the latest research and scholarship in American Revolution studies. The forty-five articles in the 2016 edition include: “Why Did George Washington Become a Revolutionary?” by Ray Raphael; “Governor Franklin Makes His Move” by Thomas Fleming; “Enlisting Lasses: Women Who Aspired to be Soldiers” by Don N.Hagist; “Tides and Tonnage: A Different Take on the Boston Tea Party” by Hugh T. Harrington; “How Was the Revolutionary War Paid For” by John L. Smith, Jr.; “Murder Along the Creek: Taking a Closer Look at the Sugarloaf Massacre” by Thomas Verenna; “The Loyalist Refugee Experience in Canada” by Alexander Cain; “Lafayette’s Second Voyage to America” by Kim Burdick; “How Paul Revere’s Ride was Published and Censored in 1775” by Todd Andrlik; “A Melancholy Accident: The Disastrous Explosion at Charleston” by Joshua Shepherd; “A Spy Wins a Purple Heart” by Todd Braisted; “Faking It: British Counterfeiting During the American Revolution” by Stuart Hatfield. Journal of the American Revolution Annual Volume 2016 is part of an annual series published by the online resource allthingsliberty.com, collecting research by a diverse array of professional historians and peer-reviewed articles written by experts in American Revolution studies. The annual volume 2016 gathers the journal's finest contributions from the previous year, offering an excellent overview of recent scholarly findings and historical understanding of America's founding. Individual writings include "A Fast Ship from Salem: Carrying the News of War", "Benjamin Franklin's Failed Diplomatic Mission", "Russia and the American War for Independence", "Enlisting Lasses: Women Who Aspired to be Soldiers", and many more. Journal of the American Revolution Annual Volume 2016 is a welcome contribution to public and college library history collections, highly recommended. "I enjoyed almost all of the articles in this publication. It was written on a level above beginner yet not so hopelessly lost in detail as most academic journals. I recognized many of the authors from books on the regular best seller lists. Their work was well documented yet remained quite readable. Most enjoyable part for me was the introduction to people and subjects not usually found in survey books on the revolution. I give it a Strong Buy !" I loved "Reporting the Revolution: Before It Was News It was History" for it's informative and fun format, quality printing, engaging imagery and boundless amounts of early American history. The Journal of the American Revolution is written by the same author and it too contains American Revolutionary era paintings and historical treasures and history of the time period. We know that kids in school are taught little about our country's founding. This book (and Reporting the Revolution: Before It Was News It was History) brings the era to life in words and pictures and showcases the Founding Fathers as real people. Kids might be find it cool that some of our Founders were "twentysomethings" at the time of the Revolution-not just stuffy old men in white wigs! This is an excellent companion book to the first book by Todd Andrlik. The "Journal of the American Revolution" is a great read for history buffs but it also will appeal to people (young and old) who want to learn more about the founding of our country by entertaining readers with fun facts and trivia. 5 stars! Journal of the American Revolution is a must-read for persons interested in the Revolutionary War and Colonial America. Todd, Don and Hugh have compiled amazing articles, paintings, newspaper articles and pictures that appeal to all of us "History Geeks". Anyone who reads this book will definitely give thought to the amazing people who came before us. The articles are very well written and will immediately grab your attention. The pictures are remarkable! The book that these three men have put together is a 5 star read!!! Anyone interested in the American Revolution should have this book on their library shelf. A myriad of well-documented articles will be found by readers of this 248-page volume, an outgrowth of the online version of the "Journal of the Ameircan Revolution" magazine. Lavish illustrations abound. You don't have to read this book cover to cover. Pick it up, read an interesting essay, then go back another time to read another. You will not be disappointed. Some articles are reprinted from the online magazine, but others are new scholarship created specifically for this volume, like a logistical study of Washington's Christmas day crossing of the Delaware by William Welsch. While I'm not involved in the home schooling community, it occurred to me that this would make an excellent supplement for parents who are interested in enriching a study of the American Revolution for their children, particularly those in middle and high school. This book claims to be Volume I. I can't wait for the sequel! Great collection of articles about the Revolution - things you don't find in the average history books. Greatly enjoyed! Gifted one to my father for Father's Day. Anxiously awaiting the next volume. to our present desire for more detailed information regarding this critical period on our history. What an adventure to enjoy the articles in this fabulous treasure trove of true events and freedom fighters fighting for freedom and liberty in America. One really begins to understand the stakes the founders were fighting for and the odds against them. It makes me so grateful to live in this nation and I will do what I can to defend the freedoms won for future generations. Deep gratitude to all the writers involved and the "keepers of the flame" who drive this publication. Bravo! What an incredible book. The website that this compilation comes from produces some of the most interesting articles about the founding of our nation. The authors make it fun and educational, exploring many topics that have been previously neglected by historians, while debunking some myths that have been taken as fact for too long. The book takes it a step further by including amazing renderings of period paintings, newspapers, pamphlets and posters that literally pull you back in time. I am the moderator for this era at the armchairgeneral.com, and it is an honor to have several of the contributors to this work as regular members at our site. The true genius of this book is the combination of intense research (each article has an extensive bibliography) that should satisfy the fussiest historian, while having prose that is accessible to readers of all ages and levels of historical knowledge. For those who aren't history fans this is one of the best places to learn that history is fun, and that just because you read it in a text book in school it might not be the truth. A lot of research went into this book and the illustrations are great. The chapters on Battle Wounds written by Hugh Harrington are particularly interesting and so are the top 10 Revolutionary War movies listed toward the back of the book. I agree with the listings for the movies I've seen. This book should be required reading for history classes studying the Revolutionary War. I'll have this book out on the coffee table for sure. The inaugural edition of the The Journal of the American Revolution stems from its parent website, allthingsliberty.com where multiple historians have come together to write articles on the American Revolution. These authors include bestselling authors, established historians, professors, high school history teachers, lawyers, and amateur historians who all share a common interest in the Revolution. The combined work covers the gamut of the Revolution and every aspect in between. This hardcover volume includes many of these historians’ articles with lavish artwork and pictures. The combined power of the articles shows that while the Revolution started 250 years ago, our interest in it remains. The best part of this book is that it was not written by professional academic historians for other professional academic audiences. Instead, the articles were written by historians who speak directly to the general public, an audience of millions that has responded quite well when history is written for them. This is one of the central strengths of the book. Far too often academic historians write brilliant histories on the Revolution, but write on a level that is beyond the educational level of most people. It is ironic that a history made by regular people has often been written for a small group of people instead of the people that make history. Make no mistake, the authors of the articles in the Journal are intelligent historians, but unlike the academics, they kept their prose couched in the language of the people themselves. The articles themselves cover an incredible range of topics and events in the Revolution. It is evident in looking through the table of contents that this is only the first volume of many more to come which is exciting because there are thousands of topics and events to write about from this period of time. A look at the contributors show a diverse group of authors as well with some specializing in various aspects of the period. In addition to the writing style another refreshing theme is clear as well. None of these articles are polemic pieces of work rooted in modern political thought. They are firmly set in the past with no thought of the present involved which is often not the case with many articles written today. Instead, these authors seem to let history speak for itself. The actions of everyday men and women formed the basis of many of these articles as they rose to the occasion manifested by the events of the period. These articles go to lengths to convey those actions. They also cover areas that academic historians might overlook or consider irrelevant. Take the case of the article on the ages of the participants during the Revolution. Many of the participants in the Revolution were comparatively young, a fact that Todd Andrlik wrote about this summer in his article which appeared on the website and in this volume. Most academic historians have known this in passing, but the general public had no idea. The reaction of the public to the ages of the participants was remarkable which just goes to show that the public maintains an interest in many details which seem trivial to academic historians. That is what these articles do in this volume. They bring life to the ordinary people, thousands of which took part in the Revolution. The actions of the people commonly referred to as great men have their articles in this volume as well, but they are only a small part of the Revolution compared to the thousands that propelled the affair and made it happen. The ideas that the Revolution was sparked by matter, but they only became a reality because the common people of that time made them a reality. These articles bring their stories to the public and show the hard and painful process that the Revolution was and how it was a bitter struggle. The end result is the opening volume of work on a struggle that was difficult and painful for everyone of that time. The artwork that accompanies each article gives perspective to the words as well. Pictures, images, and art often convey meaning and detail where words cannot. Most books on the Revolution only include a few images compared to the many pages. Not so with the Journal! The images in this book add to the articles and give them life. This is one of the best collections of American Revolution images in a long time. In fact, it gives many illustrated American Revolution histories a run for their money. When the strength of the articles is matched with these images the Journal becomes a very credible history book in its own right and a definite addition to any American Revolution library. It is hopeful that several more volumes will follow this one to form its own section on the subject. In addition to the artwork, we must also include the dynamic effect of the scholarship that went into each article. Each article in this volume went through a peer review process for historical accuracy. Every article includes a list of endnotes that list the sources used in developing the thoughts and details written by the authors. This is critical for maintaining historical accuracy and integrity. While some articles challenge long held assumptions and beliefs such as the myth of Timothy Murphy, they also show where the author got their information from and why they challenge those myths. That is how historians work when researching their topics and is a hallmark of the scholarship that went into these articles. 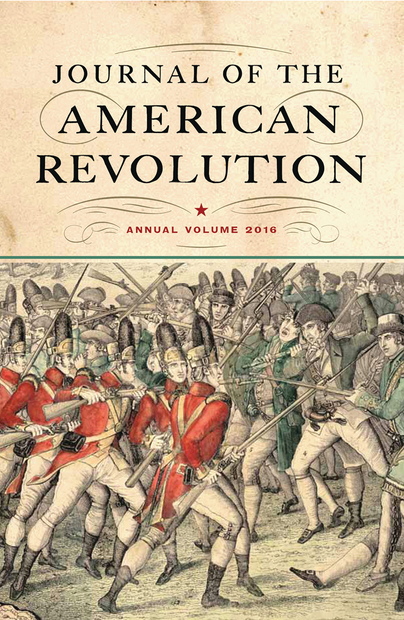 The overall result is a wonderful volume of articles and artwork on the American Revolution. Written by historians for the public, this volume is a refreshing presentation of history which everyone will enjoy. Students will find interest not only with the articles, but can also use the sources to help explore articles that catch their interest. The artwork alone is worth the price of purchase as well. Little known facts and details of the period are also brought to light which will capture the interest of many. All in all, this is a worthy volume for any American Revolution buff and American history student. Like its parent website, the Journal of the American Revolution tends toward some really interesting debates from history. Some of the finest articles involve looking into old myths to examine the true basis for such legend. One of the editors, Hugh Harrington, included an investigation into just how the legend of Timothy Murphy at Saratoga became accepted history. Fascinating. After reading Journal of the American Revolution, you get a clear picture of what life was like during that time period. interest, since it pertains to our patriot ancestors. The authors presentation draws you in and keep you wanting more. This book is a no brainer for anyone with even the slightest interest in the American Revolution. It has short well written articles, a variety of topics and tons of graphics. They are like popcorn, just try to read only one. Show this book to your friends or kids who think history is boring or the revolution is ancient history and watch as they page through the book and stop and read. My only comment to the publishers is - Please sir, can I have more! As a Founding Era researcher and writer, the highlight of my last Christmas was receiving "Reporting the Revolutionary War". That smartly-designed, easy-to-read book drew me in like very few books ever have. I found the angle of using period newspaper callouts unique, refreshing, and truly put the reader back into the revolutionary days of scanning the daily newspaper and reading the words of the times. The accompanying articles were enlightening and written for non-academics and non-scholars, but written BY trusted and true research historians and writers. So...when I received this second book by Todd Andrlik and his squad of historians "Journal of the American Revolution", my expectation bar had already been set very high. This latest book, I can truly say, is a jewel of jewels! Not only is a beautiful book in its looks and quality of printing, choice of paper stock and eye-popping use of ink in pictures, maps and illustrations, the articles are of fascinating interest ... to scholar and layman alike. The subjects explore things like (stories behind the stories) of the Sons of Liberty, Washington's spy network, and how the Continental Army actually crossed the Delaware. What role did dogs play in the Revolutionary War and some true myth-busting facts. Fascinating and a treasure to own and to refer to in my writing. Five Colonial Stars for "Journal of the American Revolution"! Featuring helpful charts, a comprehensive index, more than 30 images and scores of new perspectives, the book is designed for institutions, scholars, and enthusiasts to provide a convenient overview of the latest research and scholarship in American Revolution studies. TODD ANDRLIK is founder and editor of the Journal of the American Revolution and author of Reporting the Revolutionary War, named American Revolution Book of the Year by the New York American Revolution Round Table. A full-time marketing and media professional, his history-related writing has been featured by media and historical organizations, including NPR, C-SPAN, CNN, Smithsonian, Time,Mount Vernon, Fort Ticonderoga, and the American Revolution Center.